These are some photos of the bow pole setups. The Skate is a National class which offers high performance for a relatively low price from $2000-$6000 second hand or as a home builder $11000, the association has available a male jig or a female mould. Generous financial incentives are offered to new boat owners. 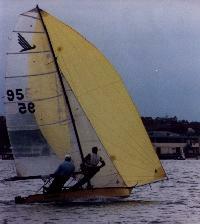 At fourteen feet long, there are few restrictions and boats can be configured to suit individual preferences. Most Skates have a 10-foot long plank for the crew, and an 8-foot plank for the skipper. 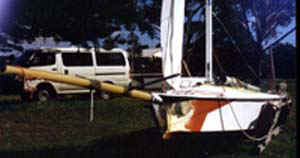 Planks are slid across the hull from one side to the other when tacking. Other configurations include short wings with two trapezes, longer wings with one trapeze, or trampolines. This is a question many people ask. What gives maximum leverage? What are easier to use? Click the link to find out. Gary Caporn has built a Skate with wings so ask him about it if you want. Visit "The Becoming of Gavin Caporn's Skate" to see it under progress. These days more and more people are considering a wings setup. You should consider it. Below is a list of prices for an amateur built Skate and photos of some boats rigged with a bow pole. Full hull - complete hull foam sandwich construction in vinylester with chainplates, external hull finish fully painted - Cost $2,000 (does not include deck fittings). Planks - tubular & Foam sandwich construction in vinylester painted - Cost $500. Deck fittings & Ropes - Cost $500. 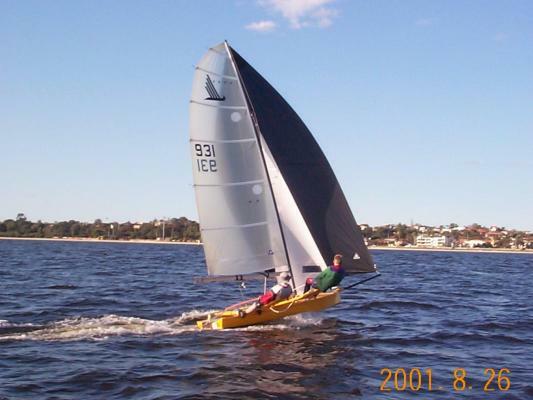 Mast - Aluminium/fibreglass composite - Cost from $500-$2,000 fully rigged. 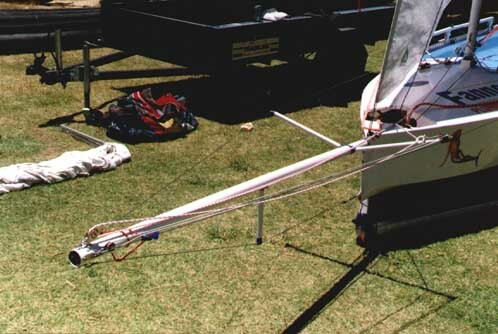 Boom - Aluminium - Cost $400 fully rigged. Rudder & Centreboard - Cost $300. 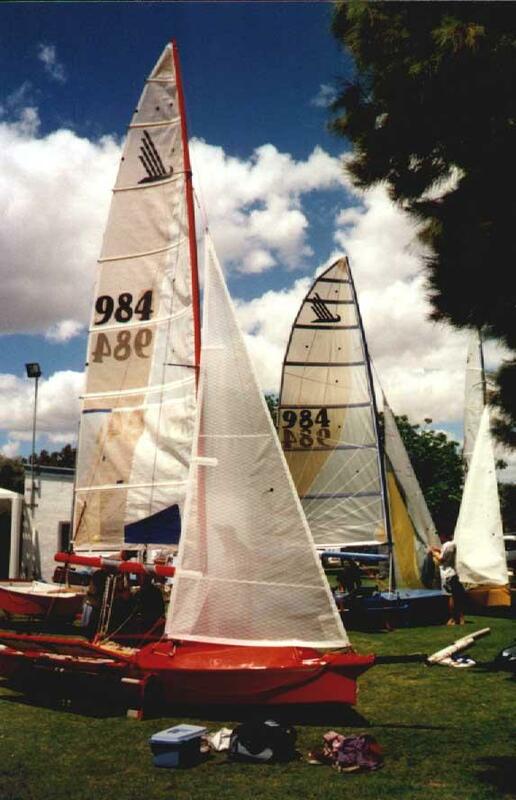 Sails - complete set (main, jib and spinnaker) - Cost $1,700-$2,200 (depends on sail maker). Amateur built price $11,000 (can be built cheaper if you shop around). Professionally built price $15,000.